The HERO3 Black Edition is the cream of the crop of GoPro's HERO3 line. While it's a huge improvement on its predecessors - and a pretty impressive package on its own - there are a few drawbacks that make it less than perfect. Despite some of its shortcomings, the ﻿Hero 3 Black Edition is an incredible action camera that easily puts itself ahead of the competition. Its 4K video, improved sound quality, and super-smooth 60fps 1080p video make it an excellent choice for semi-professionals and experienced action photographers. Despite its added features, the HERO3 Black Edition looks and weighs exactly the same as the other HERO3 cameras. It maintains the exact same light weight, the same size, and the same dimensions. For those new to the HERO3 line, the HERO3 is 25% lighter than the HERO2 and also 30% smaller while maintaining compatibility with GoPro's older accessories and add-ons. The HERO3 Black sports a monochromatic LCD on the front which is navigated using the mode/power button and shutter release. One extremely useful addition is the ability to press and hold the record button to instantly jump back to recording mode. The HERO3 sports indicator lights for the Wi-Fi and active recording, with additional recording lights along the top, back, and bottom panels. On the back is the cover for the removable battery and a connector for GoPro's BacPac accessories. The left side of the camera (viewed from behind) is the Wi-Fi button, while the opposite side features a Micro-HDMI port, a microSD slot, and a Mini-USB port behind a removable panel. The video is the biggest draw of this edition, and with support for 4K video GoPro's definitely pushed the boundaries of what a small action camera can achieve. The only drawback is the speed: 4K is limited to 12fps, which makes videos appear to stutter and stumble unless sped up or smoothed in post processing. Dropping the resolution to a still respectable 2.7K bumps the frame rate to 30fps, while 720p and WVGA support a respective 120 and 240fps. At 1080p you can manage a perfectly smooth 60fps. If you don't need an insanely high resolution, the Black Edition still has you covered. The Black Edition can take 12 megapixel still images in single-shot, time-lapse, burst, and continuous modes. Time-lapse supports intervals ranging from a half second to every minute, while burst mode supports up to 30fps for 3 seconds. The Black Edition can also record photos and videos simultaneously with a photo delay of 5 to 60 seconds. GoPro's claimed that the Black Edition's lens is twice as sharp as previous GoPros and provides better low light performance, and we can't argue with that. Images are bright, adjust well to different exposures, and have decent color reproduction. Battery life is a big concern for the power-hungry Black Edition, which can run through a fresh battery in only an hour and a half. You'll want to carry around additional batteries or invest in a battery BacPac, which will give your camera's life a much needed boost. While it's obvious that the 4K video pushes the HERO3 to its limits, it manages to record flawlessly. The camera features a quick startup time and little to no delay in recording or writing to the SD card. The camera's light weight and small form factor makes it easy to attach to a mount, helmet, or even goggles, while the waterproof casing adds to its portability. The HERO3 Black Edition is the same form factor as previous GoPros, making it available to GoPro's range of mounts, attachments, and add-ons. The built-in Wi-Fi means you can pair the HERO3 with a smartphone for remotely controlling and even remotely locating your camera. The quality of the built-in microphone has been vastly improved with the HERO3 line, reducing the wind noise of environments where the camera is moving 100 mph or less. That being said, you can still use an adapter to plug an external microphone into the Mini-USB port. 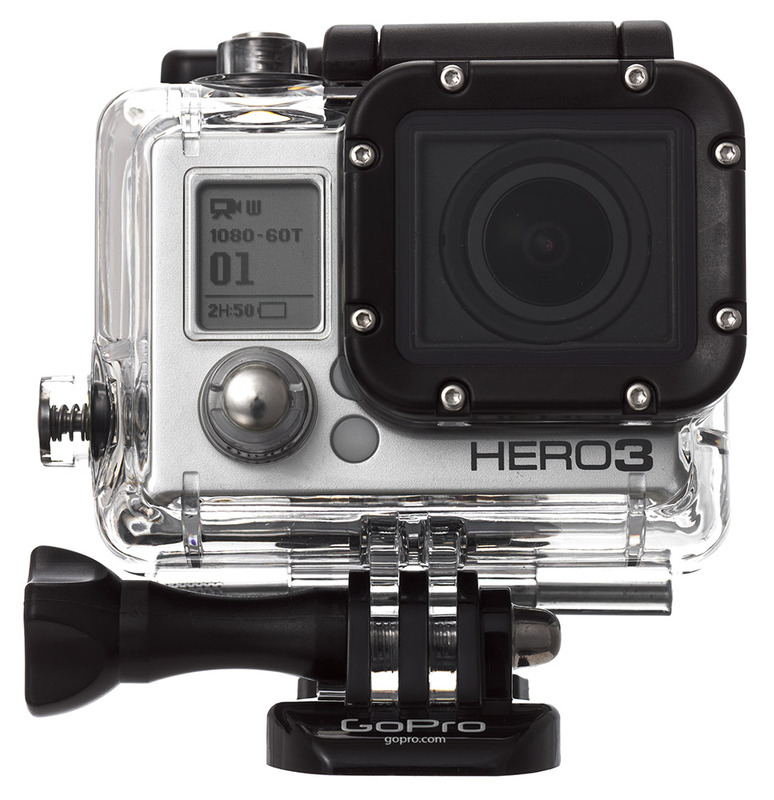 For diehard GoPro fans like us who need an exemplary action camera, the HERO3 Black Edition is a no-brainer. It's an incredibly well-performing camera with some very respectable specs. It still has its issues, notably the low framerate of the 4K video and the poor menu, but it's a sturdy action camera that gets the job done and does it well. Seasoned photographers who want a powerful action camera will find little fault with the HERO3 Black Edition. Beginners and users with a smaller budget might want to look at the White or Silver Editions instead.